Don't be put off by the name, Playmates is actually a very good read! Geared more at the games player, the fanzine concentrates mainly on games, reviews and hacking. 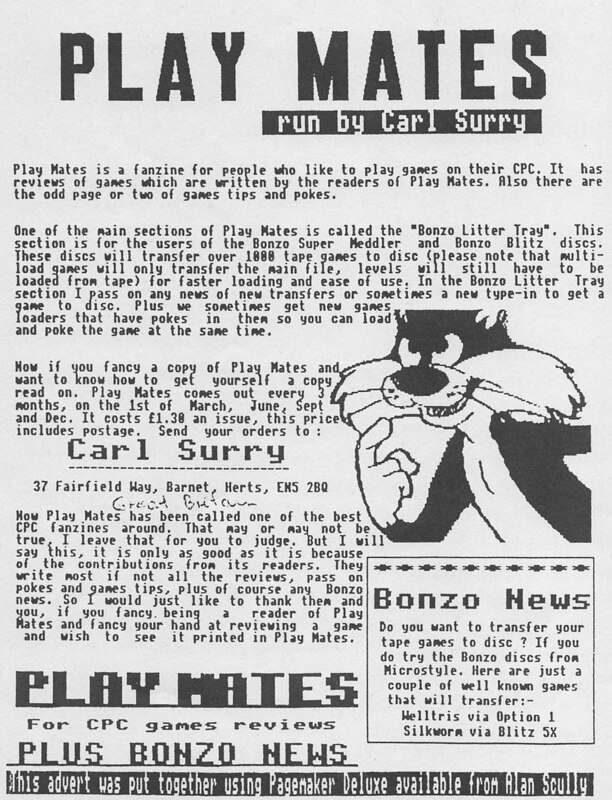 Playmates is perhaps best known for running the Bonzo Bulletin information (previously the work of Nemesis), this accounts for the majority of its readers being ardent hackers! If you are a serious user, do not be put off buying the 'zine, it covers serious issues as well! As an example, issue 9 contains details on how to upgrade a 464 to a 6128, plus a review of the user group WACCI (see later). Another Playmates passion is DTP. The magazine is littered with clip art, a definite plus, and issue 10 (out now) reviews PagemakerDeluxe budget DTP package. Playmates has come a long way since the free issue 1. If you are a games player then you will find the magazine particularly appeals to you, if not then it is still worth buying for all the other news, information and features.